Over the past six weeks, our Junior Rhodes Fellows have been looking into food insecurity and hunger. Taking primarily a regional focus, our students had an insightful conversation with the director of our farm, Jake Morrow, which served as a helpful introduction to the topic. We looked at the history of hunger and food insecurity in the United States, looking at how public and private programs seeking to alleviate hunger have changed over the years. Additionally, our students were able to meet with people like Daniel Ross '90, founder of Nuestras Raices and professor at Hampshire College, and Heather Clark of the Western Mass Food Bank. Our unit culminated with our Junior Rhodes Fellows developing their own mock enterprises related to food security. 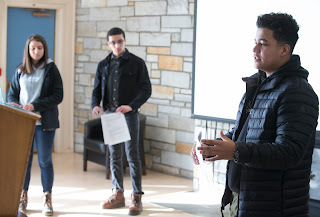 With an all-star panel of Justin Costa (Director of the Center for Self-Reliance Food Pantry), Jay Lord (Business Manager and Founding Director of Just Roots), and Jake Marrow, our students received critical feedback on their four different ideas. Mona Zhang '19, Grace Eggleston '19, and Coby Shalam '19 started us off by discussing Stalk, an app that "empowers consumers to make healthier food choices by increasing affordability and access to fresh produce.” With a target demographic of people who can consistently get enough caloric intake, but do not always have the means to afford a nutritious meal, they focused on the qualitative aspects of food security. 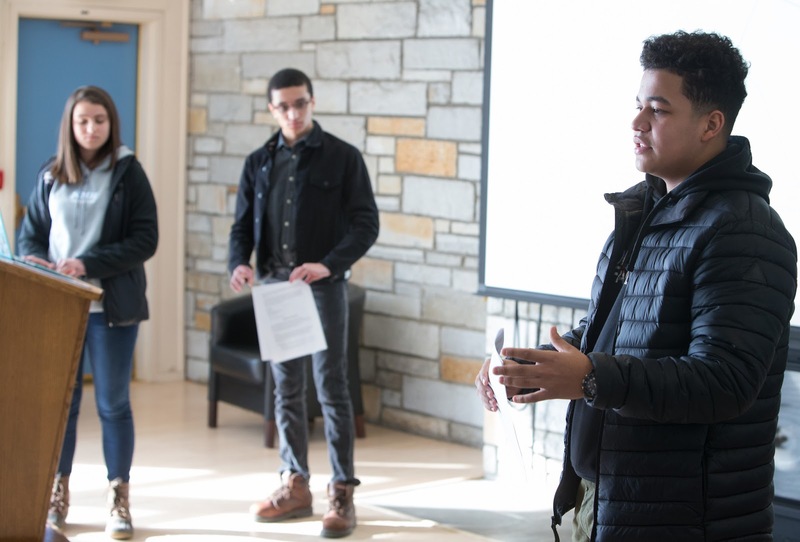 Also taking a tech approach, Mairead Collins '19, Mikayla Gilliam '19, and Sebastian Shin '19 developed Surge, an algorithm that could be used on existing grocery store apps. Having contacted multiple partners including app developers and supermarkets, the group focused on making more fresh produce available and accessible to SNAP users. Mia Flowers '19, Leah Leslie '19, and Tayhee Lee '19 developed an enterprise that addressed a need within rural Franklin County. Hearing how transportation was a related issue, they thought about how they could utilize existing resources to tackle both the transportation gaps and food insecurity in our area. Seeing an opportunity to get both NMH students and our farm more involved in the local community, the group developed an organization that would deliver NMH produce to people in low-income areas without much access to public transportation. Eliza Mann '19, Melvin Mercado Bulacia '19, and Connor Wall '19 then turned our attention to a more urban environment. With their enterprise Agrikids starting in the Bronx, the group saw an opportunity to involve youth in an after school program that engaged them in both farming and art. Working in public parks, they would partner with farmers to build up community gardens. These gardens would also provide low-income families access to healthier foods. While we now move on to discuss housing in our next unit, our students may return to these enterprises later in the spring as they consider their work ahead in senior year.